If you’d like to get a jump start on your post-holiday organizing, then don’t miss this! Every single simplify 101 online organizing class is marked down at least 60%. Buy now, save lots, and start your classes when the timing is right for you! While out shopping on Small Business Saturday, I came across an idea that would help reduce the mess that comes after Christmas morning. It’s that moment when you’re looking around at all of the new stuff and wondering where in the world it’s all going to go. This is particularly tough if you have small kiddos, who get lots of new toys from Santa when their toy boxes are already filled. So what’s a solution? 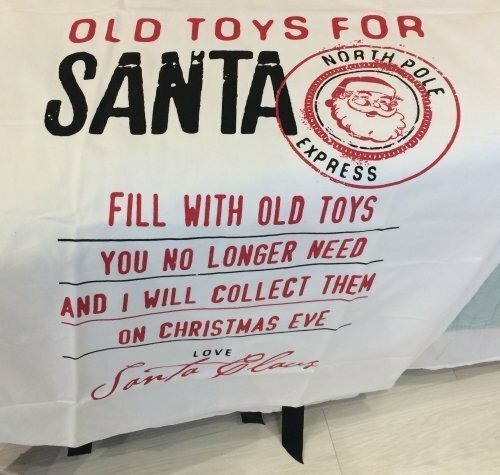 The “Old Toys for Santa” bag. The idea is simple. Get a really big bag and have your children fill it with old toys they no longer play with. Santa picks them up on Christmas Eve and either delivers them to other kiddos, or takes them back to his workshop for next year. I think this is a brilliant idea because, really, what kid doesn’t want to help Santa? I saw the bag pictured above at a local shop called Where They Roam. But other versions are available online, like this one from Pottery Barn. 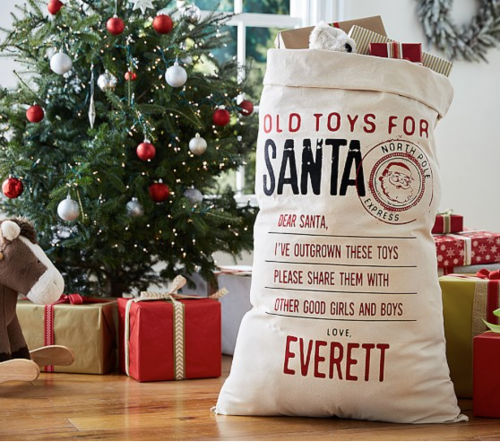 The bag is admittedly a bit pricey, so you could look for a large cotton Santa Bag or add a drawstring to a king size pillowcase, and attach a note to Santa like the one above. If you no longer have young kids at home, you can still get in on the fun. Grab your own very large sack, and as you are decorating or picking out what to wear for holiday events, take notice of items that you no longer love. Simply drop them into the bag and when it’s full, deliver to your favorite charity. Won’t it feel great to get a jump start on January’s decluttering and organizing way ahead of time? It sure will. This is so brilliant Aby that I just had to order one of the sacks for my girls! Thank goodness for cybermonday sales! Thanks for the great idea! How fun! Glad you liked the idea Alissa!